With the second-gen Maruti Ertiga ready to storm into the Indian market this Diwali, the carmaker seems to be in a rush to clear stocks of the outgoing MPV. 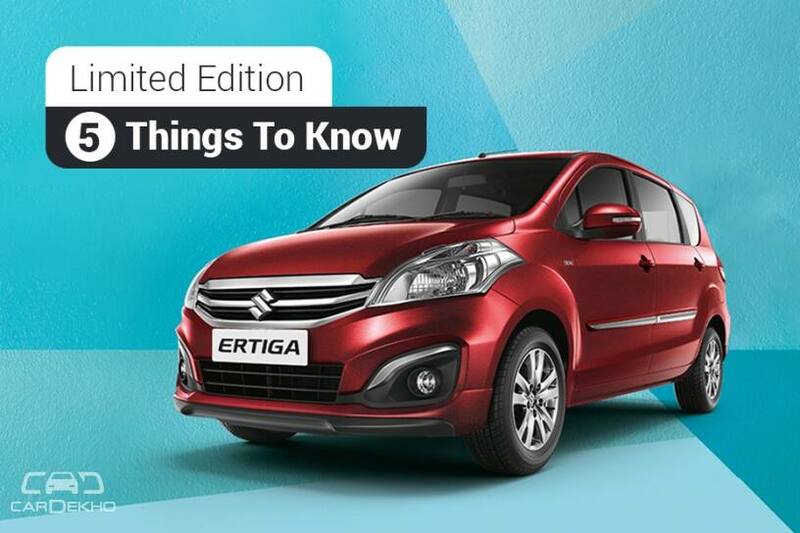 Recently, it launched a cosmetically-enhanced version of the Ertiga called the Limited Edition at a price tag of Rs 7.88 lakh (ex-showroom Jaipur). Here are five things you need to know about the special edition MPV. The Maruti Ertiga Limited Edition gets minimal changes on the outside. These include a roof-mounted rear spoiler and chrome side moulding. The Z variant even gets chrome-finished fog lamp housings and 15-inch alloy wheels, which are otherwise a part of the MPV list of genuine accessories. Last but not the least, it gets a ‘Limited Edition’ badge as well. While the regular version of the Ertiga is available in five colour options (silver, white, black, blue and pearl blue), the Limited Edition can only be had in three colours – maroon, grey and white. The maroon and grey paint options are exclusive to the Ertiga Limited Edition. The Ertiga Limited Edition gets wooden inlays on the borders of central console, AC vents and door-side armrests. The seat covers are finished in a dark red/maroon shade with white piping. It gets a dual-tone steering cover as well. There’s no change in the engine department and it continues to be offered with a 1.4-litre petrol engine that pumps out 93PS and 130Nm or a 1.3-litre diesel motor that produces 67PS and 200Nm. Both engines are mated to a 5-speed manual transmission as standard. The petrol engine, however, can also be had with a 4-speed automatic gearbox. The upcoming 2018 Ertiga was recently spied testing with a 6-speed manual transmission in India. Read more about it here. The Maruti Ertiga Limited Edition is priced at Rs 7.88 lakh for the petrol version and Rs 9.76 lakh for the diesel one (all prices, ex-showroom Jaipur). That’s a price difference Rs 14,000 to Rs 17,000 over the V variant. For the additional amount, the Limited Edition brings with it a rear spoiler and alloy wheels. Although it loses out on features like a driver seat height adjuster, rear defogger and rear wiper/washer that are offered as standard on the Z variant, it is significantly cheaper than the range-topper by about Rs 60,000.